Skillet formed in 1996 with two members: John Cooper, former vocalist for Tennessee progressive rock band Seraph, and Ken Steorts, former guitarist for Urgent Cry. The two bands met through touring together, but those bands disbanded soon after, so John and Ken's pastor encouraged them to form their own band as a side-project. Coming from different styles of rock music, they decided to name the experiment Skillet. After Trey McClurkin joined the band as a permanent drummer. 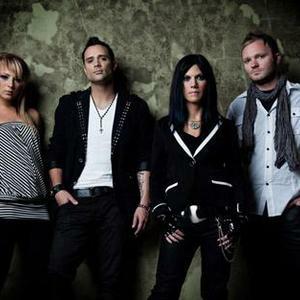 Skillet was only together for a month when they received interest from major Christian record label ForeFront Records. In 1996 they released a self-titled debut Skillet. It was well-received, and the trio continued to write new material as they toured the United States. One topic that comes up often among fans and the band itself, is the name 'Skillet'. John Cooper, the lead vocalist, explains that it was a joke at first. Each starting band member was already in a separate band, and all decided to start a side project. Since each other band had a different sound and style to it, the side project was said to be like putting all of those styles in a big skillet to come up with something unique. Hence the band name 'Skillet'. The band name is still somewhat of a joke between the band members, especially Cooper, who claims to still not like the title. Skillet recorded their follow-up album throughout 1997, titled Hey You, I Love Your Soul, which was released in April 1998. Their second effort was a change in style from the band's first release. With this release, Skillet would abandon their post-grunge approach for a lighter alternative rock and a style. His wife Korey was enlisted soon after to play keyboards live in order to alleviate John's live performance duties. Shortly before the band began recording for their third album, Invincible, Steorts left the band to be with his family, and Kevin Haaland joined the band as their new guitarist. Korey Cooper joined the band permanently and played keyboards for the recording of Invincible. Because of this change, the musical style on Invincible changed to a more electronic sound. Soon after the release of Invincible in early 2000, Trey McClurkin parted ways with Skillet, and Lori Peters filled the drummer's position. Invincible would be Skillet's best selling record to date. The band released their first worship album, and fourth album overall, Ardent Worship in Fall 2000. The band kept much of their sound from Invincible on their next album Alien Youth. With little time between touring and recording, Skillet released Alien Youth on August 28, 2001, which was the first album that John Cooper took on production duties. Before the release of Alien Youth, Haaland left the band, and Ben Kasica took over on guitar. The first single, the title track, was a major hit in the Christian market and drove Skillet into their first headlining shows. Skillet's album Comatose was released on October 3, 2006. It features the singles "Rebirthing," "Whispers in the Dark," "Comatose," "The Older I Get," "Those Nights," and "The Last Night". The album debuted at #55 on the Billboard 200 and #4 on the US Top Christian Albums chart. In January 2008, Skillet announced that their drummer, Lori Peters, was retiring from the band, feeling that "it's time for her to come off of the road and start a new chapter in her life." Peters' last concert with Skillet was on December 31, 2007. However, during the 2007 Christmas season, she took the time to train Skillet's next drummer, Jen Ledger. On October 21, 2008, Comatose Comes Alive was released; a CD/DVD combo featuring live recordings of the band's May 9, 2008 concert in Chattanooga, Tennessee. It was shown on the Gospel Music Channel on December 5, 2008. Skillet's Comatose Comes Alive CD also had a B-side with ("Live Free or Let Me Die") as a single, also with five acoustic tracks which purchasers could download by putting the Comatose Comes Alive CD in your computer. The Comatose album was certified Gold in sales by the RIAA on November 3, 2009. Skillet announced that they went into the studio January 12 to finalize the new record with Grammy-nominated producer Howard Benson. They added two songs ("Hero" and "Monster") from the new record to their setlist on April 2, 2009 in Evansville, Indiana as part of their Comatose Tour 2009. Skillet's most recent studio album is Awake. The album contains twelve songs and was released on August 25, 2009. It charted at #2 on the Billboard top 200 selling around 68,000 units in its first week. "Monster" was released as a single on July 14, 2009. Contrary to popular belief, John Cooper stated that "Hero" was not the album's lead single. It was, however, released as a single in March 2010.They also released a deluxe version with the extra songs "Dead Inside" and "Would It Matter", along with the original, radio edit of "Monster" that does not have the distorted growl as in the single and in the CD. The song "Hero" was used in the publicizing of the first football game of the 2009 NFL season between the Pittsburgh Steelers and Tennessee Titans, and the song "Monster" was used in the episode "Jason: The Pretty-Boy Bully" on MTV's Bully Beatdown. "Monster" was the theme song for the WWE event WWE Hell in a Cell while the song "Hero" was the theme song for WWE Tribute to the Troops and Royal Rumble 2010, as well as both songs being included on the official soundtrack for the WWE video game WWE SmackDown vs. Raw 2010. It is also the opening theme song for the AHL team the Lake Erie Monsters in Cleveland, Ohio and serves as the opening theme of the Fresno Monsters of Fresno, California. "Monster" was aired at the beginning of several ACC football games on Raycom Sports during the 2009 season. In the first week of April 2010, it was released for the Rock band music store in Rock Band 2 It also tied the record for highest-charting Christian album on the Billboard 200 with Underoath's 2006 release Define the Great Line and Casting Crowns' 2007 release The Altar and the Door, as all three albums debuted at #2. On February 18, Skillet was nominated for 6 Dove Awards for the 41st Annual GMA Dove Awards.Awake was certified gold July 2, 2010. A remix on Monster was featured on their podcast Also in 2010, Ardent released The Early Years, a collection of their songs from 1996 to 2001. On November 12, Skillet released an iTunes sessions EP consisting of songs from Comatose and Awake. "Monster" was certified gold a day later. Skillet performing live on April 12, 2008 at Anderson University, Anderson, Indiana. In the middle of 2006, Korey Cooper took a break from performing, due to her pregnancy with their second child. Her rhythm guitar and keyboard roles were temporarily filled by two people: Andrea Winchell (who would later become the Coopers' nanny) on keys and Chris Marvin on guitar. Skillet toured with Ron Luce and Teen Mania Ministries on their Acquire The Fire Tour across the United States and Canada in 2007. When they returned, Skillet had plans to co-headline the Justice & Mercy Tour with Flyleaf, but the tour was postponed and ultimately canceled after a number of shows due to Flyleaf lead vocalist Lacey Mosley's vocal problems. They then toured with Luce's Global Expeditions program on a summer missions trip with teenagers to Mexico. In 2008 they joined Teen Mania Ministries and toured with Acquire the Fire. Skillet joined Breaking Benjamin, Three Days Grace, and Seether on the first half of their tour in fall 2007. Then Skillet headlined their own Comatose Tour alongside Thousand Foot Krutch and traveled to approximately 30 cities. The tour started on March 28 and ran through May 11, 2008. Skillet toured again from April 2009 through June 2009 with Decyfer Down and Disciple. This tour was called Comatose Tour 2009 (essentially a second branch of the 2008 Comatose Tour). In fall of 2009, Skillet began touring with Hawk Nelson, Decyfer Down, and The Letter Black to promote Skillet's album Awake. The Awake & Alive Tour encompassed 52 cities from October through January. Skillet performing live on July 1, 2010 at Cornerstone Festival (Illinois). Skillet appeared at the 2009 Night of Joy Christian Rock festival at Disney Hollywood Studios at Walt Disney World.This marked the band's first absence from Universal Studios Orlando's Rock the Universe in five years due to conflicting schedules. However, they were able to perform the following year, in 2010. On September 26, 2009, Skillet appeared at Awakening Music Festival in Leesburg, Virginia, alongside Jeremy Camp, Kutless, Hawk Nelson, Disciple, Decyfer Down, and others. Skillet also played at the Super Dome in New Orleans for the ELCA National Youth Gathering in 2009. Skillet headlined two separate Rock the River tours, run by the Billy Graham Evangelistic Association, and hosted by Franklin Graham. Those tours were Rock the River: Midwest in the summer of 2009 and Rock the River: West in the summer of 2010. In January 2010 they toured with Puddle of Mudd and Shinedown through the East Coast of the United States. They also announced on their live chat with fans on December 5, 2009 that they would be touring with TobyMac in March and April 2010. This was later expanded upon as the "Awake Tonight Tour" named after both artists' new albums.] House of Heroes joined them on the tour as the opening act. In April and May the band continued on a second branch of their Awake and Alive tour with the Letter Black and Red.] In April it was also announced that the band would be touring with Creed and Theft in August and September 2010. In October the band will be co-headlining the "Monsters of Annihilation Tour" with Papa Roach. Trapt and My Darkest Days will be supporting acts.They will be touring again with TobyMac in November and December as the 2010 version of the Winter Wonder Slam tour. In January 2011, Skillet confirmed that they will be touring with Stone Sour and Theory of a Deadman in the Avalanche Tour. The tour will begin at the end of March 2011 and will conclude May 1 in Uncasville, CT. Other supporting acts include Halestorm and Art of Dying. The band had a small international tour in January and February 2011 visiting New Zealand, Australia and Japan.